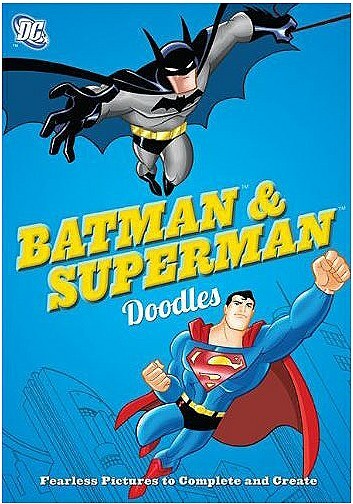 One of my Father’s Day gifts this year was the “Batman & Superman Doodles” book. This book, drawn in “The Animated Series” style, prompts its users to complete the drawings inside. Like many doodle books, it simply takes old art and wipes out spots on the page. And since this one uses art from various coloring books from the “TAS” era, the figures are spot on and easy to emulate. In fact, there are lots of books that teach you to draw in that style — though they are often pricey in places like eBay and Amazon because someone out there believes they have some collector value. My first completed drawing allowed me to design new puppets for the Batman enemy called The Ventriloquist. I really like the cyclops. Can you spot the hidden hero I added to the drawing? Next up, we find out that Brainiac has more than one miniaturized city in his evil, robotic clutches! I added the two cities in the foreground. 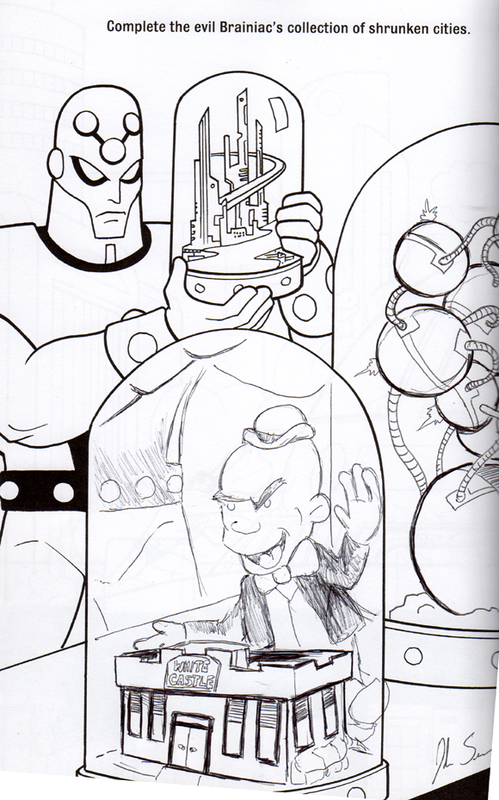 Hey, how did Mr. Mxyzptlk get in on this? These two were a load of fun to do, and there’s literally dozens more to try. Playing with these is a great stress reliever for an adult — really who wants to waste a cool book like this on the scribbles of a kid. As a guy who fancies himself an artist, there’s no commitment to create something great or something worthy of selling. It’s just about having fun and relaxing. And as you fill up the book, you create a pretty neat no-pressure keepsake, too. As for the quality of the book, it’s top-notch. The paper is thick and opaque. The binding is strong. The cover is even thicker. My only complaint is that its tough to scan the pages since the drawings disappear right into the gutter of the book. Likewise, it’s difficult to draw deep into those gutters too — you can blame the tight binding on that. I hope to post more of these “completed drawings” every once in a while, so check back. And what about you? Let’s see some of your completed doodle pages!